Sometimes, I think they make books for me. 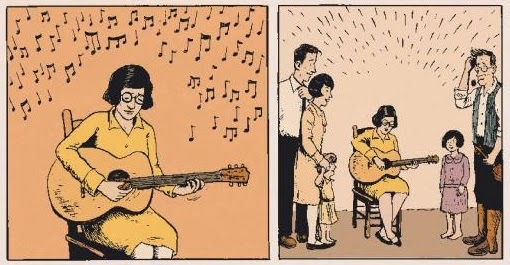 Frank M. Young and David Lasky, for example, decided I needed a comic book about the Carter Family. And I did. 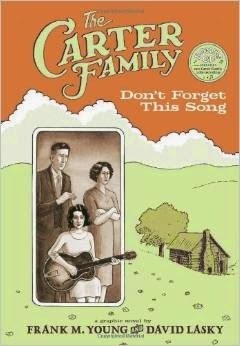 The Carter Family: Don’t Forget This Song is simply a wonderful book. 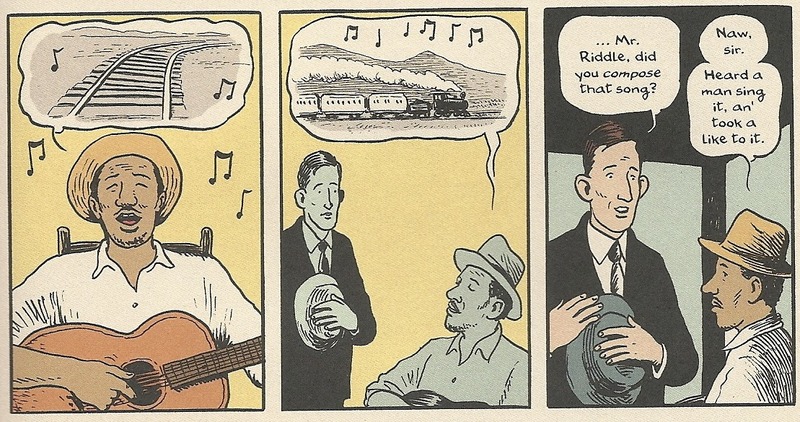 Part domestic drama, part historical narrative, Young and Lasky’s graphic novel is a perfect primer not only on the Carter Family—often identified among the founders of country music—but also on the early development of recording industry, in which A.P. and his wife and musical partner Sara found themselves ensnared. Their relationship is not only central to the Carter Family’s history, but their divorce was a result, in many ways, a product of the group’s success. Writer Frank M. Young weaves these two narratives together in a subtle, almost superficial manner, which I always appreciated. This is a delightfully bare story. David Lasky’s art aptly complements Young’s sparse narrative, his simple, sometimes rushed cartooning augmented considerably by full color. Full color. That’s an extra point right there. Don’t Forget This Song moves through decades of the Carter Family’s career rather briskly, but it works. This episodic structure, which drives me crazy in biopics, was perhaps better suited to the Carter Family given the relatively undramatic nature of the group. There is never a sense that we’re missing much in the months or years that pass between chapters. Much of the book is devoted to the mundane aspects of the music industry and music-making, as well as the rural life the Carters enjoyed back home in Virginia. We really don't need that much information on A.P. 's sawmill. A.P. Carter, the patriarch (of sorts) of the Carter Family, is the center of Don’t Forget This Song, especially in terms of his relationship to Sara, his onetime wife and lifelong musical partner. To some extent, A.P. is typical of many musicians—head in the clouds, domestically inept, secretly mercenary. Fortunately for A.P., there was no script for him to follow back in the thirties, not yet a Bob Dylan or even a Hank Williams, no trailblazers show him how pop stars are supposed to act. So he pretty much moped about as his marriage collapsed. A.P. was, furthermore, from another era in rural Virginia. He was a family man and a farmer. A miserable failure at both, but that was what he thought he was. Though music, or rather music collecting, was his passion, the Carter Family itself was a venture, a way to make money. Frank M. Young doesn’t necessarily treat A.P. Carter with kid gloves—he’s definitely left on the hook for the breakup of his marriage—but the reader is nevertheless left with a lot of sympathy for the old fool. If there’s one more reason to recommend this book, it’s the actual book itself—hardbound, full color, CD included. (CD!) People judge you on the books you own. So own this, and you’ll look cultured. I’m probably a bit biased. I like nonfiction comics. I like country music. I got Don’t Forget This Song as a gift. (And in turn bought another copy as a gift for a buddy.) All these things may have colored my reading of this, but I doubt it. Young and Lasky have simply produced a wonderful book.